"Don't hang out in Montmartre, kid. You'll end up a pavement princess." There's an aspect of watching Bob le flambeur that's rather like the childhood game of Telephone, or using one of those websites to translate a passage from English into a foreign language or three and then back into English; the gist may or may not be the same, and it's probably recognizable, but it bears the marks of the journey. The stereotypical Frenchman may be haughty and contemptuous of Americans, but happily for us, Jean-Pierre Melville is the opposite: he loves America, American culture especially. (He took the surname of one of the great American writers as his professional name, for instance.) Bob le flambeur demonstrates Melville's deep love of American gangster pictures, refracted here through a French lens, and since turnabout is fair play, it's easy to see the influence of this movie on later American pictures like The Killing or Ocean's Eleven. Closer to home, Melville's film anticipated the coming of the nouvelle vague, of Truffaut and Godard, by a good seven years at least. Their films are fine, but Melville was there first. Qu'est-ce que c'est un flambeur? "High roller" seems to be the best translation, as "gambler" isn't quite accurate or grand enough. 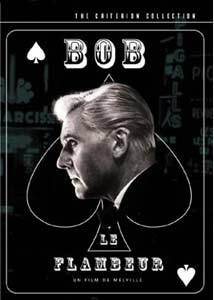 Bob is a gangster haunting the night in Paris' Montmartre district, with a rakish charm, a world-weary manner and a sweet convertible. He keeps vampire's hours, going to bed at six in the morning, and awakening for the next night on the town. The very dapper Roger Duchesne plays Bob, and in his trenchcoat and fedora is deliberately reminiscent of characters in Hollywood movies played by Cagney and Bogart. But this is no pale imitation: Bob is a well-drawn character in his own right, not merely a collection of movie attributes. Duchesne of course gets the most screen time, but the other actors fare well here, and Melville seems to just love them. He plucked 15-year-old Isabelle Corey off the streets of Paris to play Anne, and there's something completely disarming in her performance; like the rest of the cast, her technique isn't especially polished, but together they're a winning bunch. Much of that may be due to the inherent theatricality of criminals, measuring themselves against their movie doppelgangers; it's easy to imagine future generations of French gangsters going to school on Bob le flambeur, like Tony Soprano and his crew watching GoodFellas as a training film. Melville seems to be having as much fun with his camera as with his characters. He's fond of dolly shots, moving into mirrors and then back out to the objects and people reflected in them; and there's editing razzle dazzle, too, with lots of wipes and irises in and out. (Part of this is surely due to economy, as this relatively low-budget feature anticipates the filmmaking style of American independents by decades.) Jazz seems to be on every radio and in every nightclub, and it's another instance of Melville paying homage to American culture while making many of its elements very much his own. Like so much else, this depends on whether or not you like it. If you do, it's a tribute; if you don't, it's stealing. But Melville is an artist, not a ripoff artist, and his movie reflects both his passion and his craft. Image Transfer Review: A couple of blotches on the print appear now and again, but given that the movie was made on the cheap, the image looks pretty terrific all these years later. Some of the night shots of Paris are extraordinarily beautiful, and as with many noir pictures, the director is content to keep his characters frequently in the shadows. Melville's thing for neon signs plays especially well. Audio Transfer Review: The mono track is generally free of interference, though the ambient noise level sometimes seems unreasonably high. Extras Review: Perhaps not a feast of extras, but some interesting stuff on hand nonetheless. The first documentary is a January 2002 interview (21m:58s) with Daniel Cauchy, who plays Paulo in the film. He's charming discussing the making of the picture�it was shot over two years, as Melville scraped together financing, allowing them to shoot a week here, a few days there�and also the many fans of the movie he has encountered over the years, including Steven Spielberg, Harrison Ford and John Woo. The second is a 1961 radio interview with Melville, conducted by Gideon Bachmann for WBAI in New York; Melville's command of English is pretty steady, though the two sometimes lapse into French, and hence this sounds less like a polished bit of radio than like raw footage (which is what it is). Stills from the movie appear on screen as Melville discusses his love of American movies, other films of his that the interviewer hasn't seen, and why being a filmmaker is better and easier than being a novelist. The trailer is an original French one, with subtitles; the ragged quality of the image here shows just what a fine job Criterion has done cleaning up the feature. Movie love infuses every frame of Bob le flambeur, as it pays its respects to the gangster pictures that preceded it and paved the way for later, better-known movies that bear the mark of its influence. And film history aside, it's a great, entertaining, smart movie, in a swanky new edition. Bet the house on this one.